More information on all the different seminars can be viewed below. 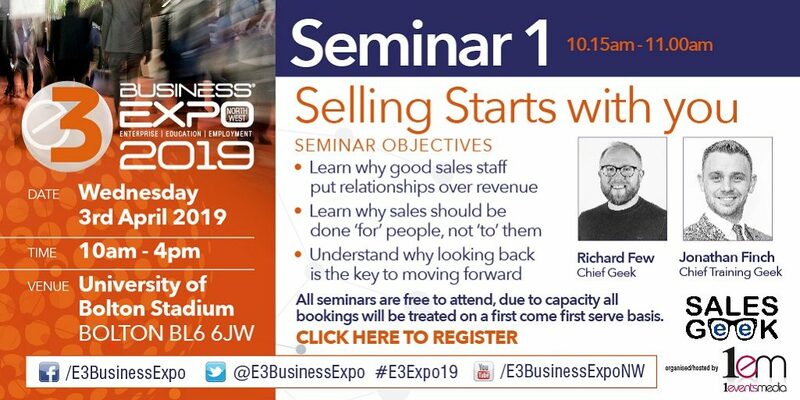 Delivered by Sales Geek founders Richard Few and Jonathan Finch, this interactive 45 minute session considers why human relationships and long term thinking are so crucial to successful sales performance. “The industry is changing,” notes Jonathan. “There was a time when people thought the internet would transform the nature of sales transactions – making them much faster and impersonal – but, in the last few years, things have come full circle. Good sales staff are recognising that the industry is driven by relationships. Customers want reliable, sustainable partnerships with their suppliers, so good sales practice must be about long term commitment; learning what customers need and going the extra mile to add value. Peppered with opportunities to ask questions, to reflect and to participate in the discussion, this fast-moving session will look at how both buyers and vendors can get more from their relationships. Importantly, it will also examine how companies can achieve more sales by working more intelligently with their past and existing customers, rather than assuming that new sales can only ever come from new contacts. The seminar will be ideal for small business owners and all those with a professional responsibility for sales and business development. The emphasis on relationship-building makes it relevant to customer services staff, commercial managers and marketing professionals, as well as anyone with a direct or indirect responsibility for revenue generation. 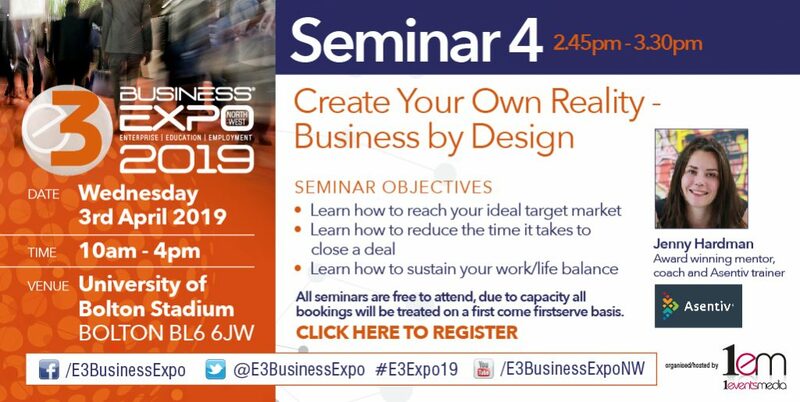 Click here to register for the E3 Expo 19. Delivered by Tracy Heatley, Managing Director of Better Networking and Business Over Breakfast (North West), this engaging seminar examines a range of techniques for getting better results from business networking. It’s a fact that some people gain more business from networking than others, but why is that? What makes the difference? In this session, networking, marketing and NLP expert Tracy will be sharing her ‘seven secrets’ to building rapport, building key business relationships and creating a regular stream of referrals. Properly employed, these techniques can yield more cost-effective business development results, support growth and help to build both awareness and reputation. This seminar will give you the capability to get better results, build better business relationships and attract better referrals. Promising a few ah ha! moments along the way, this seminar will also leave delegates with a sixty second pitch to be proud of. The seminar will be well suited to small business owners and anyone responsible for new business development. 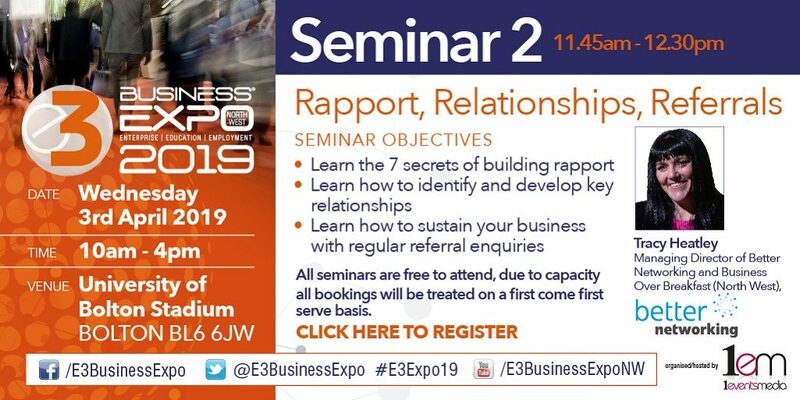 This seminar places a strong emphasis on relationship-building so it will also be of value to business directors, commercial managers and marketing professionals who want to attract new customers. Running a business can be the loneliest job in the world, but it doesn’t have to be. 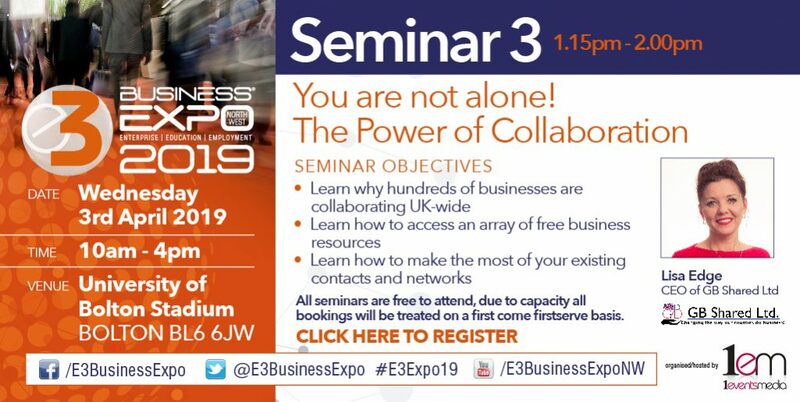 Attend this interactive workshop and you’ll learn how to identify and tap into your resources, how to maximise your network of contacts and how to make collaboration work for you. Delivered by Lisa Edge, CEO of GB Shared, this 45 minute session examines how to work smarter by working more collaboratively. Despite leaving school with no formal qualifications, Lisa went on to lead on education across Lancashire for almost 17 years before launching her own company. She spent many years retraining, she has been nominated for numerous awards, and she was recently named as a Northern Powerhouse Partner. To do this, Lisa drew upon every single resource and opportunity available to her. This workshop not only shares that journey, but explains how the same principles of collaboration and sharing opportunities can deliver better results for everyone. The session elaborates on some of the tools available to us; tools which are sometimes missed or not fully utilised. Attendees should leave this workshop feeling inspired, aware that they have a fantastic network of people and resources available at their fingertips! The seminar will be ideal for small business owners who want to work smarter, take advantage of new opportunities and find information that will aid their business journeys. This session is delivered by Jenny Hardman: award-winning mentor, coach and Asentiv trainer. Jenny’s honest, no-nonsense approach to the business world combined with her unique personal style is guaranteed to leave a lasting impression. Did you choose to become self-employed because you wanted to work 100 hours a week? Or was it the illusion of the flexibility that you fell in love with? Do you feel the need to take back ownership of your time? Many people believe that their target audience is ‘anyone and everyone’, so they spend huge amounts of time with people who will never buy from them. Using this ‘fire hose’ approach is ineffective, resulting in frustration and stress, which often spills into home life. Jenny has first hand experience of the stresses of running multiple successful businesses while also being a mum of 5 children. She genuinely understands the need to find an effective work/life balance, and she has developed tools and strategies to help business owners to do just that. This seminar will give delegates a more defined idea of who their target markets are, and how to reduce client acquisition time from an average of 8 hours down to just 5 minutes. Ultimately, this is about helping people to find ways of working with those they choose to work with, and not those who cause pain and suffering. It’s about alleviating stress and regaining personal time while still being successful in business. The seminar will be well suited to business owners and directors who are focused on business development, relationship-building and client acquisition.